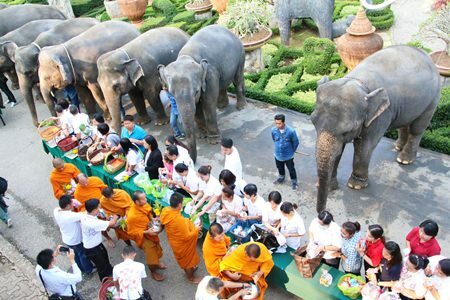 The hard working elephants of Nong Nooch Tropical Garden were given a day off in their honor, complete with a Chinese-style buffet feast, as the Pattaya tourist attraction marked National Elephant Day. 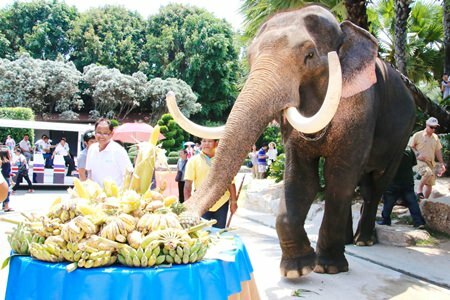 The hard working elephants of Nong Nooch Tropical Garden got a day off in their honor, complete with a Chinese-style buffet feast, as the Pattaya tourist attraction marked National Elephant Day. 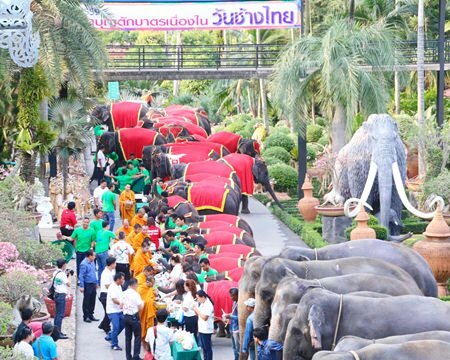 Park Director Kampol Tansajja and employees led 51 elephants to a March 13 merit-making ceremony with nine monks from Samakkee Banpot Temple led by abbot Kaseam Kittisophon. 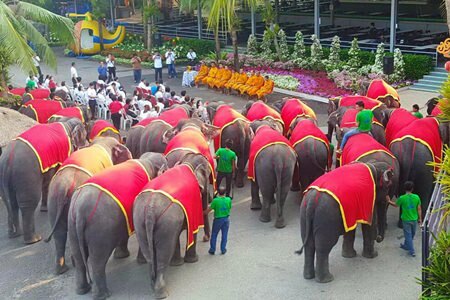 They blessed the elephants with holy water. 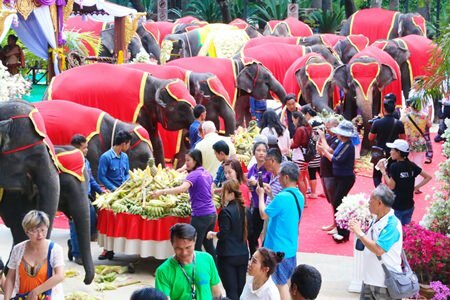 In the afternoon, Nong Nooch management was joined by Nipon Khemklat of the Chonburi Livestock Office and officials from the Tourism Authority of Thailand to bring all of the park’s 65 jumbos to the annual Elephant Day feast. 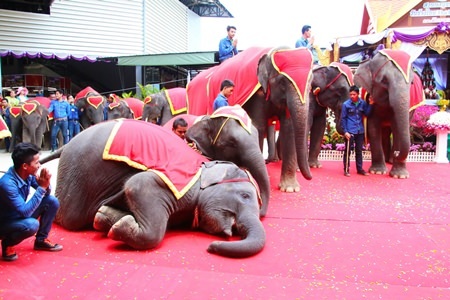 The pachyderms performed a Baisri Luang Thai-style dance before they could eat and elephant-spirit guru Tui Salangam named new baby elephants. 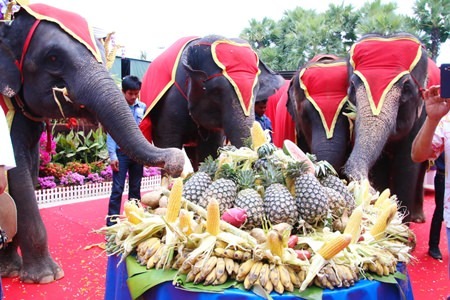 The elephants then were led to 19 tables stocked with fruits for them to indulge in. 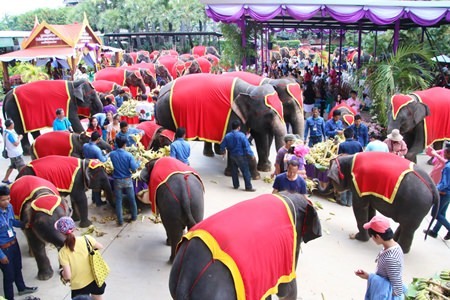 Currently, Nong Nooch has 12 bulls and 53 cows under its care with more expected. 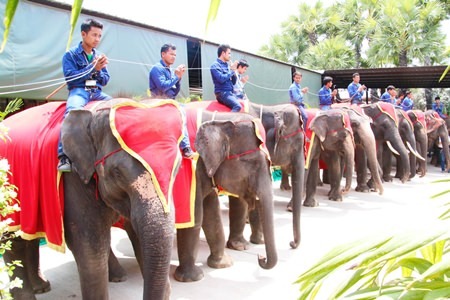 The garden was approved by the Department of Livestock Development as the first world-standard elephant camp in the eastern region on July 30, 1984. 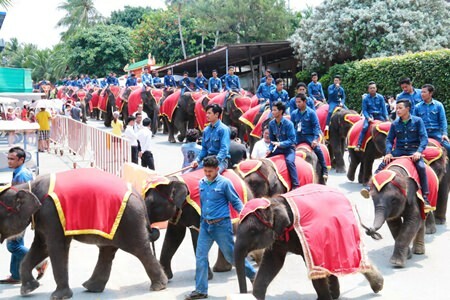 It also was certified for elephant activity for tourists by the Ministry of Tourism and Sports in 2010. 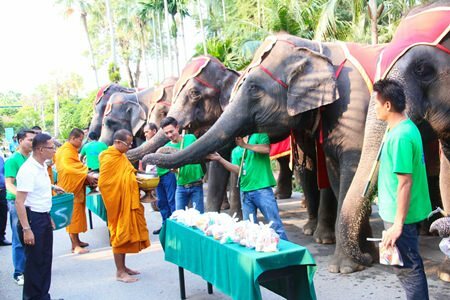 Elephants began the day presenting alms to monks. 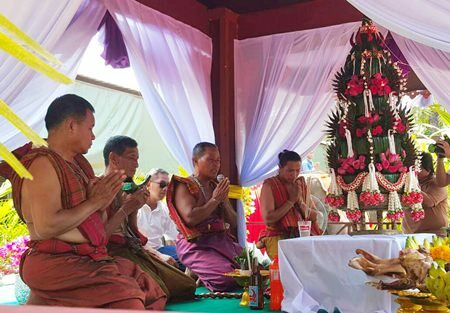 This giant receives a holy water blessing from Samakkee Banpot Temple abbot Kaseam Kittisophon. 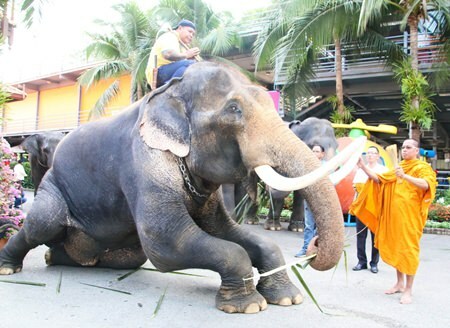 This “little” one shows its respect for Buddhism. A table full of fruit all to himself. 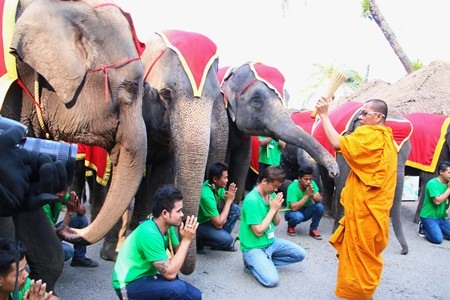 The respectful pachyderms receive a holy water blessing. The chow line at the buffet was as long as it’s ever been. Making merit is an important part of the day. Beautiful women performing traditional Thai dance add their own charm to the proceedings.